I am finally doing something from my "bucket list." Look out Chicago, On the 16th I'll be on my way to the Summer Craft and Hobby Association Trade Show. Perhaps the most exciting part of this is seeing new products firsthand. Meeting the designers I'd admire will be a plus also!! I'll post details - not sure that photos will be permitted but I'll share what I can. In the meantime, I'm designing and constructing a guestbook for a niece's wedding the weekend after the Trade Show!! I have a number of pages put together and about 5 more to go. 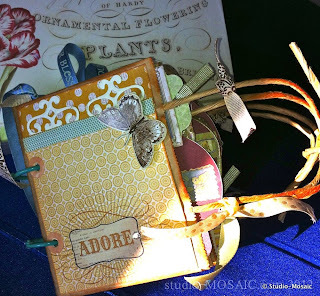 It's so much fun putting these mini-albums together, and, boy, do I have a hard time stopping the embellishing!! Next project is a banner for a friend's new granddaughter, then I may submit some projects for publishing. Then, before you know it.......summer will be over. Hope you have a great time at CHA Summer ! Thank you, Sandy! I'm getting excited! !